Five minutes and a little chilling time in the fridge, and you’ve got a tangy, zesty, “secret” sauce that’s equally at home on a burger as it is over a simple bed of greens. Far less expensive than store-bought and it tastes, well, a thousand times better! Pure class, baby. This post is pure class. Today I’m mixing mayonnaise and ketchup and calling it a recipe. 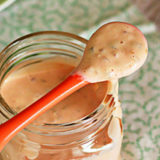 Except, actually, I actually do consider this Homemade Thousand Island Dressing a fairly legitimate recipe. And there are a few other things in there too. And it’s really, really (really) tasty. 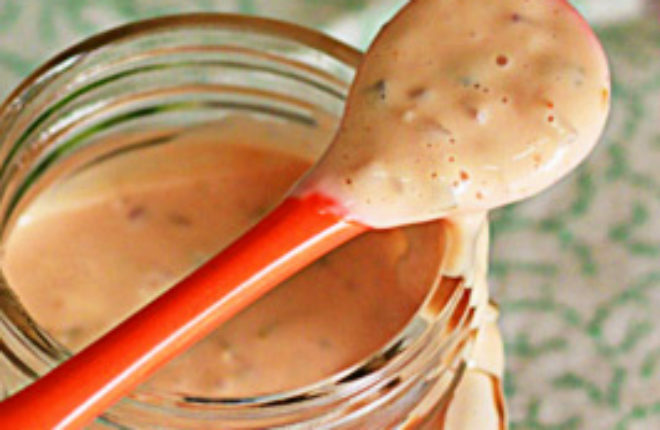 It’s homemade thousand island dressing. Thousand island, you’ve come a long way, baby. I mean, from the store-bought version, that is. 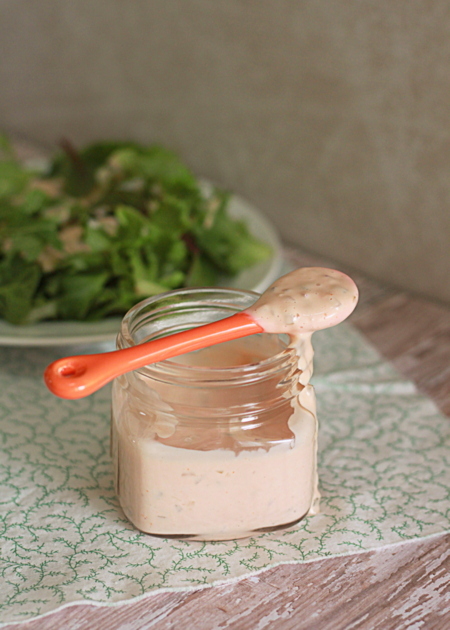 It is so easy to make thousand island dressing that I’m sort of kicking myself for ever buying it ready-made. Five minutes and a little chilling time in the fridge, and you’ve got a tangy, zesty, “secret” sauce that’s equally at home on a piled-high burger as it is atop a nice, simple bed of greens. It’s far less expensive than store-bought and it tastes, well, a thousand times better. I don’t know why they call it thousand island, but I could probably come up with at least 1,000 ways to enjoy this stuff. P.S. You know I had to Google it as soon as found myself typing that I didn’t know the origin of the name. Turns out “the name presumably comes from the Thousand Islands between the United States and Canada in the St. Lawrence River. In the Thousand Islands area, one common version of the dressing’s origins says that a fishing guide’s wife, Sophia LaLonde, made the condiment as part of her husband George’s shore dinner.” Thanks, Wikipedia! And thanks, Sophia. Note: I’ve recently updated this recipe to include an option for homemade vegan thousand island dressing. It’s a pretty easy swap – just use Vegenaise or another fave vegan mayonnaise instead of the classic mayo. Done! 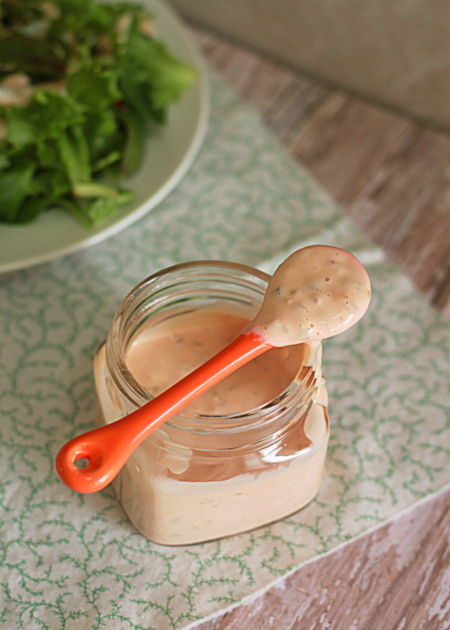 Here’s a video that shows you how to make homemade thousand island dressing either way, or scroll on down for the recipe! Keeps refrigerated for 3 – 4 days (probably longer, but for us it’s long gone by then). Use a vegan mayo such as Vegenaise. Great dressing. As a chef I used to make 5 gallons a week of all our dressings to include 1000 island and Green Goddess. I made a slight variation and used chili sauce instead of catsup and used lite mayonnaise plus a pinch of sugar. Came out great! Love the idea of chili sauce – I need to try that ASAP! Thanks! I always used chili sauce instead of catsup and tastes much better. I used the Beef House Restaurant recipe and thought it was fantastic. Enjoyed the recipe, however the next time I make this recipe I’ll use chopped, small gherkins to keep down the excess liquid. We couldn’t find a good store bought Thousand Island so we tried this recipe and we’ll never go back. It’s easy and full of flavor. We doubled the recipe so we’d have enough for several crab and shrimp salads. We’ll be making more for a Rubin sandwich. AMAZING! The Thousand Island Dressing comes from the area you mentioned, but you may not know that it was once a very posh summer and winter holiday area from 1880 to about 1930. I just spent a night there, camping at a State Park on Lake Ontario near the the Thousand Islands, just where it joins the St. Lawrence river. I found out all the history at a museum in Clayton and fishing excursions with picnics really were very popular in the heyday. In certain shops there you can buy the “real” dressing, but I think your homemade one would be fine. They call it Thousand Islands Dressing – originally known as Sophia’s Sauce because the recipe originated in the Thousand Islands. This unique and once the play ground of the very rich during the gilded age was and is a fisherman’s paradise. Today, although and nonetheless beautiful, and still a vacation destination, like most of upstate New York, the evidence of poverty can not be denied. A couple of the highlights of the region from a bygone era are, Bolt Castle and Singer Castle. I have a copy of the original, hand written recipe. Yours is close, but you’ve added some embellishments not in the original snd omitted three ingredients. Well? What are the 3 missing ingredients?, CJ? Half Cup Ketchup (I would definitely use Chili Sauce, as although it is basically ketchup, it has less sugar and in all likelihood more historically accurate. Mix in bowl, keep cold. That is the recipe my Mother used to make. Can’t wait to try it!! The egg ruined this version of the recipe for us. The written recipe above is better imho. This is FANTASTIC! Thank you so much for sharing this!! I used red onion like you suggested and it’s so fabulous! I have just made this dressing as I was making a pasta salad and had all the ingredients together and then found that I didn’t have any store bought thousand island dressing……..found this and just threw the basic ingredients into the salad without any accurate measurements and it is amazing!! I used a good quality whole egg mayo, tomato sauce, ground salt and pepper, white vinegar, the last of a gherkin relish and bottled minced garlic……so good! Thank you very much! This is a great dressing. Way better than store bought. Will never buy it again. Loved it! Great taste. Not sweet tasting as bottled dressings sold in the store. Easy to make and I love it. Really delicious! After making it still tasted a lot like mayo and was very light colored. I left out the onions and had to modify by adding another tsp of sweet relish and another tsp of ketsup. It was perfection after that! Tasted better than the store bought bottle that was sitting right next to it! Really good! So much better than refrigerated brands or bottled. Thanks, will be using a lot! Making this on Christmas Day because we had no Thousand Island dressing and the grocery stores are closed. It’s terrific and turns out to be organic except for the vinegar! Thanks for such an easy and delicious recipe. Sorry but I will stick with Kraft Thousand Island dressing!! This recipe is nasty, no way in heck will I ever eat tabasco sauce in my Thousand Island dressing!! Did you actually make it before commenting? Somehow I doubt it. You OBVIOUSLY didn’t even make it. Awesome! Easy and delish! Made for Ruben “egg rolls”, and it was amazing. Better than the restaurant version we tried. Thank you for sharing!! Love, LOVE, LOVE this dressing! I make it with Sriracha or Tobasco Ketchup and 1/4 tsp black pepper for an extra zing. It’s great! I think one could add a little horseradish to this as well, to great effect. I just put corned beef onto cook. This dressing will be great for reubens, can’t wait. Thanks! Thanks for sharing this recipe. My daughter and I love 1000 island dressing. I would like to start making my own dressings. That relish sounds like a fantastic addition! Just made this, it just tastes like mayo! I was so excited after reading reviews but am so disappointed now! What a waste of time, I followed the recipe to a T! I’m betting you’re not a fan of mayo..I’m not either! I substituted mayo with nonfat plain greek yogurt and it’s phenomenal!!! Well now I am craving a vegan Reuben. 🙂 Thanks so much for your comment; so glad you liked the recipe! I made this Thousand island dressing for the the Ruben sandwiches I grilled tonight and it was absolutely a hit . Deliciously perfect and I’ll make it fresh from now on . I added a little extra hot sauce to kick it up just a notch , to make our corned beef juicy in every bite . 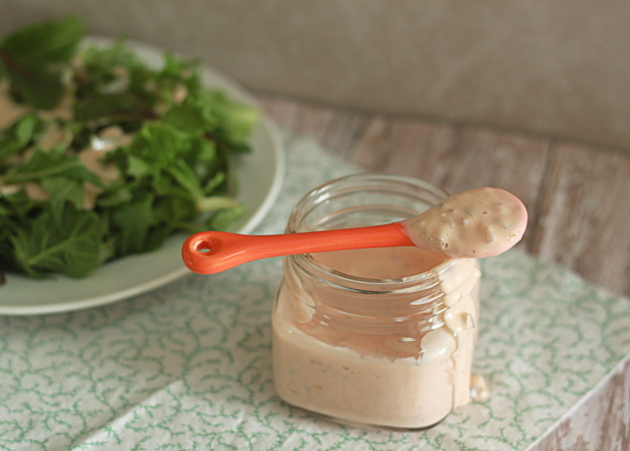 I made a double batch of this dressing and it was gone in less than a week. Everything from cherry tomatoes, salads, and of course on my hamburgers. This has to be the most delicious 1,000 island dressing I’ve ever made or tasted in a restaurant. Be sure to use a quality mayo, like Best Foods, and don’t forget the finely diced celery. You will NOT find a better recipe anywhere in my humble opinion!! Enjoy! Instead of using relish I chopped up some pickles and used some of the brine, it worked out really well! So happy I’ve finally started making my own dressing because I’m constantly going through bottles with how many salads we make, and our little ones will only touch green leafy dishes if its smothered in thousand island dressing! Thanks for sharing! So glad everyone likes it! 🙂 Thanks Sam! Just made this recipe with vegan mayo for some vegan big macs using Beyond Burgers. It’s awesome and much better than the “special sauce” used by the Golden Arches. Thank you! Very simple to put together and its tastes great. We ate it with Reuben sandwiches. I made this recipe non fat by switching out the mayo for non fat plain greek yogurt and it’s amazing for 1/12th of the calories and none of the fat! Delicious! I ran out of Thousand Island dressing and searched online and found yours. Oh, No! I never buy relish! Then I remembered a trip I took over the summer where I purchased ‘Spicy Zucchini’ relish, thinking wow, this is… different. I was a bit concerned when I read ‘sweet’ relish on your recipe knowing the only relish I had available was ‘spicy’ relish. When I took a sample taste of the spicy relish, it wasn’t super spicy. I used a bit less relish and simply added a dash of sugar to the relish, to sweeten it up. With fingers crossed, I added my relish to the ingredients. I tasted the end result just before refrigerating and it tasted good, so good, I didn’t need to add salt. Once chilled and ready to serve, this salad dressing was delicious. Thank you for sharing your recipe, Kari! I am excited to try and taste more recipes you post! I tried it both exactly as written and also by adding a 1/2 teaspoon of horseradish.. Delicious both ways.